It's a rare occasion when I feel like adding milk, sugar, or other flavors to my tea, but the only exception is bubble tea. I love the sweet milky tea taste, with a dash of tea thrown in. It's also fun to have the chewy tapioca pearls at the bottom (boba). A few weeks ago we were shopping in a Korean grocery store in Queens, and I came across a strange box in the tea aisle. 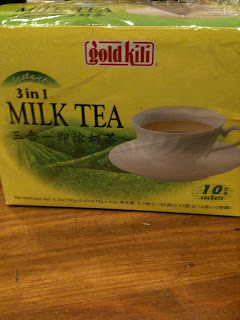 It was '3 in 1 Milk Tea'. I have to say I was intrigued, and had to try it. I pretended not to notice the artificial flavors that were added, just as I overlook it when I order bubble tea in a shop. 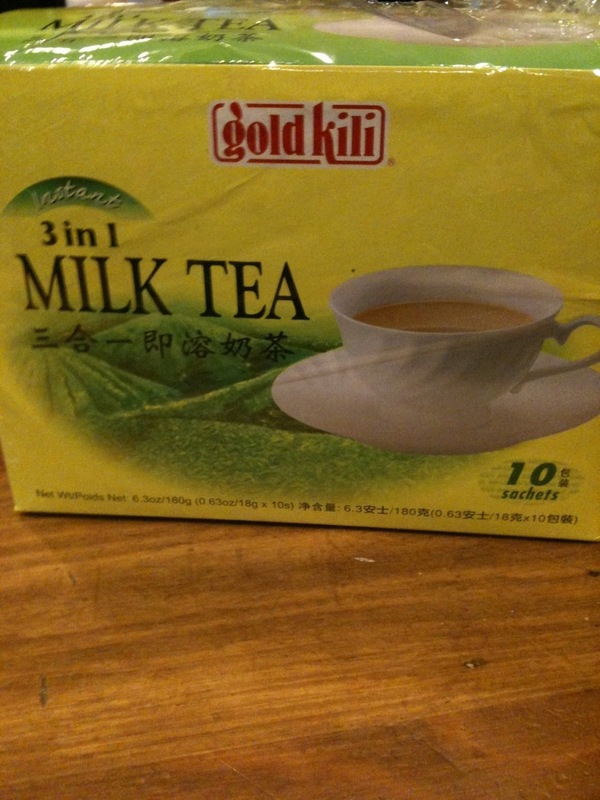 I'm assuming the '3 in 1' means milk, tea, and sugar? The tea is made in Singapore. I don't think I've ever had a tea product from Singapore before! The ingredients are sugar, creamer (aka lots of stuff that is bad for you), a milk derivative, some preservatives and artificial color, and then finally instant tea. Not really something I'd drink all the time, but it's handy to have around when I'm craving a sweet, milky tea taste similar to bubble tea. 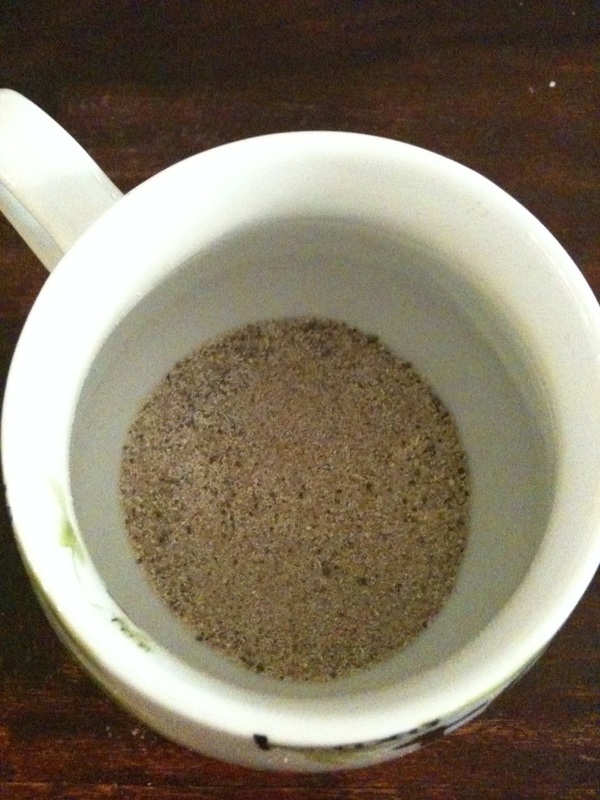 It is easily prepared by just pouring the mixture into a cup, then adding boiling water. The 'tea' has the comforting flavor of sweet cream, but there is also a strange bitter flavor that feels dry on the tongue. Similar to burnt toast. A sweet and oily feeling lingers on the tongue for quite a long time after the tea is gone. I don't really get any strong tea flavor, it's really more of a hint of tea. The slight tea flavor reminds me of thai iced tea. It definitely reminds me of the milk teas I've had at bubble tea shops, but less flavorful. Still, it is a fun and quick way to have a tea that reminds me of an occasional indulgence. While it's not a pure tea flavor, it is a fun diversion. My favorite instant milk tea is the 'Super' brand but as of this year i can't find it anywhere! None of the Stores have it anymore and I fear it might have been discontinued. I am on the hunt for new kinds because I just can't live without it! I've been enjoying Super brand (Malaysian) milk tea for the last 4 years so maybe you have been as well. Now, the packaging has changed and so has the formula. It tastes nothing like the original! Sad to say, I consider it discontinued finally and I'm on the hunt for a replacement. That's really too bad. I hope you can find a good replacement!! Oh, hmm, I don't know that brand, but I will keep an eye out for it here. Do you know what country it comes from?